Panasonic’s flagship rangefinder style, MFT format Lumix DMC-GX7 is a complete overhaul of the earlier GX1, announced late 2011. The new model adds several notable features over the original including a high-resolution, widescreen format tilting electronic viewfinder with proximity sensor, pull out tilting rear screen and for the first time from the maker, a new in-body stabilization system. As with other models from the firm, the GX7 has promising video capabilities with Full HD 1080p AVCHD clips up to 60 fps, including a 24 fps option. The GX7 is said to include a new 16Mpix Live MOS type sensor featuring a ‘redesigned on-chip lens’ arrangement with a 10% increase in color saturation. The consumer electronics giant also claim a 25% improvement in signal to noise ratio and a 10% increase in detail, though it’s not clear if the firm is referring to the GX1 or the later, video-oriented GH3, as both models share a Live-MOS type sensor with the same pixel count. 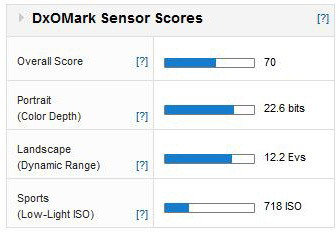 With a DxOMark Sensor score of 70 points the image quality of the GX7 is competitive and closes the gap in performance with the best APS-C size sensors used in rival mirrorless models. The sensor has high color depth (at 22.6 bits) and a wide dynamic range of 12.2 Evs. Even the Low-Light ISO score of 718 ISO is not far behind the larger APS-C size sensors used by rival offerings. 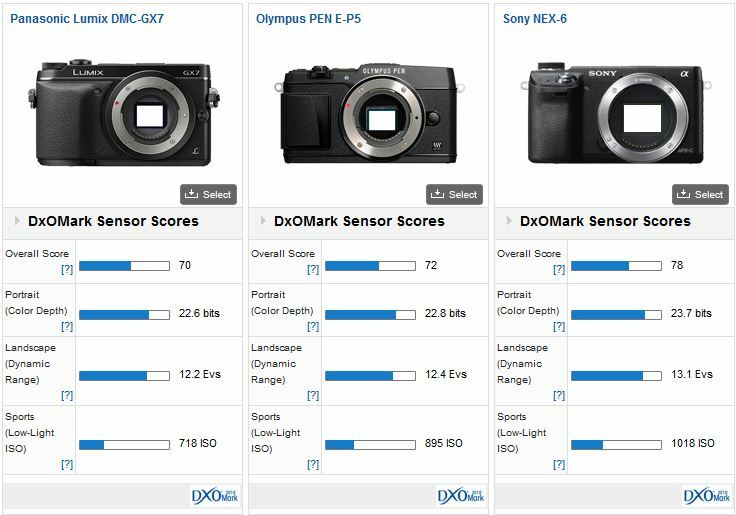 Each score is similar to the firm’s high-end Lumix DMC-GH3, which is Panasonic’s best performing model, and suggests the sensor in the GX7 is a derivative rather than a completely new design. Compared to rival offerings, the GX7 performs very similarly to that of the Olympus PEN E-P5 (a model that’s thought to share the same sensor as the Olympus OM-D E-M5 and the Panasonic GH3) and it’s only -1/3 of a stop in overall image quality behind the 16-Mpix Sony NEX-6. The eight-point lead of the Sony is slight in real terms. With a Color Depth Score of 22.6 bits, the GX-7 is -2/3 stop behind the Sony, and around -1 stop less than that model in dynamic range. Perhaps most telling of all is the gains made in the low-light score. It’s just -1/2 stop less compared with the Sony, and around -1/3 less than the Olympus. 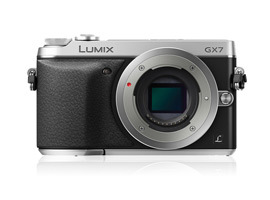 The Panasonic Lumix GX7 is certainly a compelling model. Not only does it now feature in-body stabilization (that’s compatible with any lens fitted) but it also silences critics of the original GX1 over the lack of an EVF. Couple that with the competitive performance of the new 16-Mpix L-MOS sensor and you have a camera that’s classy, refined and very capable.